From the outside, it is business as usual at The Working Capitol, the co-working space that occupies 11 of 19 floors at 140 Robinson Road. The freehold commercial tower was developed by WyWy Development and was originally known as Crown @ Robinson. Since The Working Capitol became the anchor tenant, it secured naming rights to the building. Launched in March last year, the 55,000 sq ft co-working space was the largest in the CBD then. 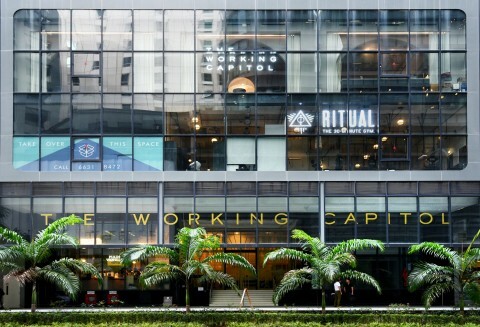 This marked the second location for The Working Capitol, following the success of its flagship space at 1 Keong Saik Road, which was launched in March 2015. The Working Capitol was co-founded by siblings, Ben and Saranta Gattie. However, just a year after opening, there has been a change of management control over the operations at The Working Capitol on Robinson Road. The master lease at 140 Robinson Road is held by The Working Capitol (Robinson), which in turn, sub-lets the co-working space to members as well as provides them with services in that location. The effect of the winding up order means that control of The Working Capitol (Robinson) has been placed in the hands of Don Ho Associates, who will now administer the business in the interests of the creditors. “For the time being, operations at The Working Capitol on Robinson Road will continue as per usual,” says Gattie. However, some members who spoke on condition of anonymity to EdgeProp Singapore are concerned about their membership at The Working Capitol on Robinson Road. “I was recently offered six months rent free by a competitor across the road,” says a member who requested not to be named. “It was a tempting offer, but I’m choosing to stay put.” He took up a hot desk at The Working Capitol on Robinson Road last year as he liked the ”vibrant community” there. He has another six months on his remaining contract at The Working Capitol. Located directly opposite 1 Keong Saik Road, the new project at 89 Neil Road will add another 30,000 sq ft of space in the premises there. Gattie calls the neighbourhood “our Keong Saik campus”. In addition to 1 Keong Saik Road, he has since expanded into the immediate neighbouring units at 3 Keong Saik Road and 120 Neil Road. The addition of 89 Neil Road space will bring The Working Capitol's total operations in Keong Saik area to over 70,000 sq ft.
Gattie intends to accommodate much bigger teams in the new co-working space there. For instance, about 15,000 sq ft of space on the third floor of 89 Neil Road will house anchor tenants such as a multi-billion-dollar MNC, which has grown from five staff to 16, and now to 90 people. The remaining 15,000 sq ft at 89 Neil Road will be used to expand the offerings for members, including a rooftop event space, new F&B outlets and other lifestyle options. “We are working on some exciting new-to-market concepts, which we hope will further enhance the experience of both our members and our surrounding community,” he says. As the co-working business continues to evolve, there is a greater need for operators to differentiate themselves in terms of industry exposure, experiences, services and communities catered to, says Sulian Claire Tan-Wijaya, executive director of retail and lifestyle at Savills Singapore. “For example, The Great Room has a more luxury hospitality feel compared with the more youthful millennial WeWork vibe,” she says. Increasingly, there is a convergence of private members club concepts, where like-minded industry leaders congregate to network, collaborate and socialise under one roof, adds Tan-Wijaya. Straits Clan and 1880 are examples of this. “In some cases, there is a certain level of prestige to be associated with a more upmarket members business club,” she says. Therefore, The Working Capitol’s strategy to now focus on its “campus” at the Keong Saik area and create its own feel and community is the way to differentiate itself, says Tan-Wijaya.